Would Being Vegan Really Solve Climate Change? Not if We Don’t Kill the Cows. A friend of mine drew my attention to this NPR blogger, who makes the point that being “good” isn’t zero sum (a situation where what is gained by one side or cause, is lost by another). If you’re concerned about the environment, you can both recycle cans and buy a more climate-friendly car. If you are passionate about children’s education, you can volunteer in the classroom and financially support literary projects. In most cases, doing good is not an either/or. Which made me think a little more about the definition of “good”. To that writer it meant being vegan or vegetarian, in the belief that such a diet would improve animal welfare and environmental impact. Yet this is exactly where the conflict arises for me – if we were all vegan or vegetarian, what would happen to the sheep, the cow, the pig and the chicken? I posed that question to a vegan on Twitter recently and he, in all sincerity, answered that we, as a vegan population, would care for the animals, but would not enslave or control them. Imagine the beautiful utopia where we all have time to calve a cow or throw some grain to feral pigs before we set off to work, expecting nothing in return. Or in a more realistic scenario, we’d have more meat than we knew what to do with simply through car accidents if we suddenly let loose the USA’s 87.7 million cattle (never mind the 62.1 million pigs, 5.2 millon sheep and 9+ billion chickens). Anti-animal agriculture activists often purport that a cow can live for 20+ years in her “natural” state compared to a farmed animal – so being a data nerd, I did the maths*. Let’s assume that 1) cows first calve at two years of age and that 90% of cows (38.3 million of them in the US at present) have a calf every year**; 2) 85% of those calves survive (mortality would go up due to predation, assuming we wouldn’t shoot wolves, coyotes etc. ); and 3) each cow or bull lives for 20 years. Admittedly that doesn’t account for the cattle that would die from starvation through lack of available grazing in 5, 10 or 20 years time, but being good vegans, we’d feed them, right? Within five years we’d have 602 million cattle in the USA, within 20 years we’d have 3.7 billion – a 40-fold increase on our current national herd. That’s 40x more cattle belching methane, drinking water and producing waste, every single day, all as a result of our changing our diet in an attempt to reduce environmental impact. It’s a nice, simplistic, oft-suggested argument that we shouldn’t eat meat or dairy products in order to save the planet, yet the conflict between veganism, animal welfare, and environmental impact is clear. Climate change will be solved by us turning vegan? Not unless we reconcile ourselves to killing animals without eating them. This entry was posted in Activist, Animal Welfare, Beef, Carbon Footprint, Cattle, Chicken, Dairy, Eat less meat, Environmental, Farmer, Feedthe9, Land, Meat, Meatless Mondays, Pigs, Sustainability, Swine, Vegan, Vegetarian and tagged Beef, Carbon Footprint, Caring, Cattle, Chicken, Dairy, Environmental Impact, flawed assumptions, Good, Meat, Meatless, Methane, NPR, pork, Poultry, Predators, Swine, Vegan, Vegetarian. Bookmark the permalink. But what if I don’t believe livestock even contribute to climate change in the first place? Does that clear the way for me to eat a burger? And what if I don’t believe that anything humankind does – whether in agriculture or any other sector of the economy – causes the planet’s atmosphere to change temperature, up or down? Can I cook a roast tonight? And what, heaven forbid, if I believe the sun has more of an effect on our planet’s climate than ANYTHING anyone or any industry does or doesn’t do? Can I eat steak? Please help me. I’m very hungry. Well, if you don’t believe it, then you’ll be impervious to any claims made by the anti-animal ag brigade, so yep, go for it! Double bacon cheeseburger with a side of jerky. You mention the issue of zero sum, so what about the issue that grazing animals are a NATURAL part of Earth’s ecosystem? Given the record of the Humane Society of the United States, they will be the first ones out there offering to euthanize all these extra cows (I don’t even want to think who’s going to have to figure out how to bury them) so they stop contributing to the ‘methane problem.” How are they going to replace the soil building effects of cows? Are we going to reintroduce the buffalo? If you think sharing the road with deer is a problem, have fun with bison. Quite right! And just wait until those silly vegans try plowing up grazing land to plant crops for human consumption. It will be the Dirty Thirties all over again. Agreed! The biodiversity advantages offered by grazing livestock presumably don’t apply – a mouse or sage grouse’s life isn’t worth saving if it means cattle are still present? I’ve yet to hear a rational argument as to what we’d do with all the livestock – but I’m still listening! Agreed. If you’ve ever been to the New Forest in England, where cattle, pigs and ponies roam free you’ll know how much chaos it causes, though it’s amusing watching people trying to “shoo” horses out of the road so that they can drive at 50 mph. Yep, presumably we’d find magical solutions to the absence of pharmaceuticals, leather, wool, lanolin, etc. Interestingly though, we haven’t found them yet, so…? The breeders would just slow production as demand decreased. It’s an industry…..! That certainly qualifies you for a spot on the “stupid comment of the year” list. Let’s think about cattle. Unlike the market for Labradors or Persian cats, there are very few farms (if any, in fact) that are simply “breeders”. Cows have to get pregnant to have a calf to raise for beef (obviously) and to make milk. Therefore cows get pregnant on farms and ranches every single day. In the vast majority of beef operations, that’s achieved by a bull finding a cow who’s in heat, jumping on her for a quick 6-second thrill and 9 months later, a calf is born. So let’s assume we are all vegans and so do not eat or “enslave” animals. That means we let them go free to follow their bovine desires. We do not breed them, we do not castrate them, we do not alter their behavior, they are allowed to roam free. Bull meets cow, cow conceives. 9 months later, calf 1 is born. 3 months later cow conceives again. 9 months later calf 2 is born. 3 months later, cow conceives as does her daughter (calf 1). 9 months later calves 3 and 4 are born. 3 months later, cow, calf 1 and calf 2 all conceive…. And on and on, ad infinitum. Note that one bull can easily service 25 cows in a short time period and that young male bulls aren’t too choosy about getting their mothers/sisters/cousins in-calf. So in a few years time…exponential increase in cattle population. If we simply didn’t want to eat meat but were still happy to farm cattle (for some nebulous unproductive purpose) then your comment would be correct, but you seem to have missed the entire vegan “let them roam free” factor. I think what Mike Hamblett envisions is a world of “pro-choice” livestock management whereby a bull would be allowed to impregnate a cow, and the cow would undergo a tax-funded abortion, but only once her mammary glands had kicked in once again. It’s important that farmers start respecting a cow’s right to choose! I have nothing to add Mischa…but am laughing! I know this is a random website that I just ran across, and that this post doesn’t deserve a response, but I just can’t help myself. First, I’m vegan, ooohhh…….the enemy… haha. Next, animal agriculture is incredibly inefficient (hello govt. subsidies…), dirty, and inhumane. But I’m pretty sure you really know this, and just write inane articles because of your rising anxieties about people finally getting a clue. Pretty simple solution I’d say. Stop hindering efficiency and economic progress please. A good metaphor would be that the time has come to let go of the horse and carriage mentality and embrace cars. Not the enemy at all – I was vegan when I was in high school – though I do wonder why you bothered to comment if the post doesn’t deserve a response? Inefficient, dirty and inhumane? Got any real-life experience or scientific papers to back this up – or just copying and pasting from the PETA book of activist comments? As I’m sure you’re aware, there are few direct government subsidies to the beef industry save for drought assistance – not sure where your claimed billion would come from? Sterilizing all livestock? Really. So cattle, sheep, pigs and poultry species would cease to exist at the end of their natural lifespan. That doesn’t seem very humane. Don’t they have a right to reproduce? What makes you think that your dietary choice is justification for the extinction of several species? How very egocentric. I find it amazing that vegans, organic activists, animal rights activists and environmentalists always try to pretend we think they’re the enemy. It’s the other way ’round! Here we are, minding our own business, raising cattle and growing crops, and along comes these activists… anti-modern-farming activists no less, who plan to shut down animal agriculture… and they want to pretend we all woke up one day and decided to make them the enemy. Give me a break. We’re all too busy running our farms. I am not a fan of PETA. Actually, none of the vegans I know are. I come from a long line of farmers from South Dakota. I love farmers…Just not animal farmers. It just doesn’t make sense. I think that old-school nutritional education encouraged people to think of animal protein as superior, but modern science is making that view obsolete. Once you take away people’s obsession w/ animal protein, what do you have to justify animal agriculture? Nothing but taste, and you can get that from the newest forms of plant-based protein. Don’t believe me? As far as ineficiency, Winston Churchill realized the absurdity of animal agriculture in 1931, “We shall escape the absurdity of growing a whole chicken in order to eat the breast or wing…” http://teachingamericanhistory.org/library/document/fifty-years-hence/. And as far as subsidies, you wouldn’t be able to “grow your beef”, etc. w/out billions of dollars of govt. subsidized feed crops that aren’t even human suitable. Don’t insult my intelligence. We could make that argument about any food – once you take away people’s obsession with the taste of chocolate, wine or broccoli, what is there to justify producing it? Sure, we could all consume a number of pills and protein shakes every day to fulfil our nutitional needs, but where’s the fun in that? Winston Churchill celebrated his 74th birthday by going fox hunting (http://www.theguardian.com/uk/2010/aug/01/winston-churchill-army-fox-hunt-germany) – does that mean it’s now an acceptable practice? As for crops that aren’t suitable for human consumption – I suggest you reexamine your sources. Corn, soy, wheat and rice (the top 4) are entirely human-edible. Furthermore, a high proportion of the corn varieties that are not directly human edible are converted into corn syrups and starches for human consumption, or ethanol – again for human consumption, though as fuel rather than food. Neither the cow-calf operation (accounting for 50% of a beef animal’s life) nor the stocker operation (25%-30% of its life) are dependent on corn and soy, but instead on pasture, forages and by-products from the human food and fiber industries (e.g. cottonseed meal, apple pomace, bakery waste etc). We could absolutely “have our beef” without needing corn and soy – it’s simply more efficient to use them in the feedlot (~20-25% of the animal’s life) especially as soy meal is a by-product of soy oil production – again for human use. I’ll cease to “insult your intelligence” when you demonstrate said intelligence through an understanding of the beef production system aside from the “everybody knows” propaganda. Until then, I see little evidence of it. You’ve missed the point. Do you believe that livestock only breed because we make them do so? That if a bull is in a field of cows in the wild he will choose celibacy rather than jumping on the nearest heifer in heat? How do you suppose wild animals breed without human intervention? I have absolutely no issue with your dietary choice, but I do have an issue with arguments based on nonsense. Perhaps, as you suggest, you should “get a clue”? No no Judith, Bethany is right, just look back a few hundred years ago when native americans were primarily gathers and lived off the land. The bison herd then was only…. wait for it… 50 or 60 million. Oops. Guess I was wrong. Oh and Dr. Capper correct me if I am wrong, but isn’t how the cattle drives started back in the day was because there were too many long horns wandering around and were becoming a nuciance? Also Bethany might want to take a look at wild hog numbers, because I am pretty sure we aren’t “breeding” them on our ranch, but they are breeding none the less. Great post, Jude. Going FarrrTHUR here today. Thanks! 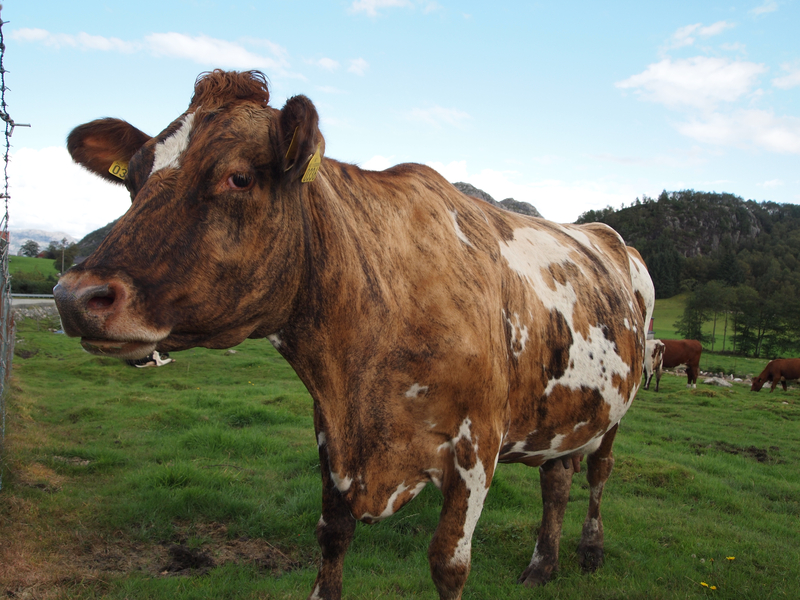 I dressed up your Norwegian cow pic with your title and web address and featured it on my site. I typically email these altered images back to authors I reblog, but I don’t have your email address. If you’d like the file for this, just shoot me an email to the address that shows up with my comment and I will send it to you. I’ve been working on and off today on an appropriate intro to this post, but as my gusty inner blogger practically wrote another whole article. So, I’m saving that for later and asking you to simply go FarrrTHUR with Jude, the Bovidiva Ph.D.
You may remember that she talked about Elvis and Rainbow-belching Unicorns a while back. You know you want to go FarrrTHUR again with Jude. Thanks Ed. Yes, I agree – assuming the links are to show that we can have sustainable livestock production!